Hand Pallet Truck are designated as Legal for Trade. To maximize efficiency in large-scale delivery/distribution/pharmaceutical applicationsÂ and increase flexibility ofÂ warehouse/delivery operations, legal for trade (LFT) hand pallet truck usesÂ 4 certified load cells to generate data withÂ percentage of error of 1 lb for loads up to 3,000 lb and 2 lb for loads from 3,000–5,000 lb. Design with onboard thermal printer, quick lift pump, and exchangeable/rechargeable battery facilitates movement between docks, and available functions include gross net weighing, automatic/manual tare, totaling with sequence of loads, and piece counting. GREENE, N.Y. — The latest integrated scale hand pallet truck from Lift-Rite® maximizes accuracy and efficiency. Ideally suited for large-scale delivery, distribution and pharmaceutical applications, the new legal for trade (LFT) hand pallet truck provides a lowercost opportunity to make warehouse and delivery operations more flexible. The truck is convenient to move between docks to avoid congestion and provides a quick backup should a facility’s in-floor scale require maintenance. The scale truck achieves LFT status by using a total of four certified load cells to generate data with a percentage of error of just 1 pound for loads up to 3,000 pounds and 2 pounds for loads between 3,000 and 5,000 pounds. Additionally, the truck is able to provide a thermal on-board printer, a quick lift pump and exchangeable/rechargeable battery. Functions include gross net weighing, automatic and manual tare, totaling with sequence of loads, and piece counting and can be programmed from pounds to kilograms. Customers ordering the new Lift-Rite LFT scale truck usually can expect to receive orders within 10 days. 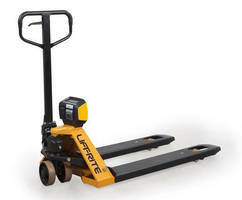 For more information on the Lift-Rite LFT scale truck or to locate a dealer, visit liftrite.com or call 800-558-6012. Lift-Rite is a global manufacturer of a wide range of hydraulic hand pallet trucks and related pedestrian controlled vehicles. Lift-Rite hand pallet trucks encompass manual, power assist, motorized, and high-lift models and are built for a variety of applications and environments. LiftRite engineers the most durable, versatile and comfortable trucks in the industry to keep our customers moving forward. ©2016 Lift-Rite. All rights reserved.